Attention Nike lovers. There’s now a car to take over when your athletic shoes just won’t do it. Subaru claims the Crosstrek is “equipped for play and built for doing.” There’s more truth to that evaluation than you’ve come to expect from automotive advertising. With a static ride height of 8.7 inches, all wheel drive, and nubby Yokohama Geolander tires (225/55R17), the Crosstrek is a legitimate off road tool, eminently well suited to outback forays, winter endeavors, and expeditions to the supermarket. Crosstrek certainly looks feral enough, with a hunched feline silhouette that’s about to pounce on the next strip of unexplored terrain. Inside, the Abercrombie & Fitch outfitting furthers the Indiana Jones illusion, with rough hewn cloth seats, ribbed rubber matting in the storage area, standard roof rail system, heated front seats, and rear hatch wiper/washer. If you select the Hybrid Crosstrek, which is a new offering from Subaru this year, you also get model-specific five spoke 17 inch diameter alloys that mimic the Fuchs wheels Porsche used as their trademark for over 30 years. Their simple design complements the heavily sculpted contours of the Crosstrek. 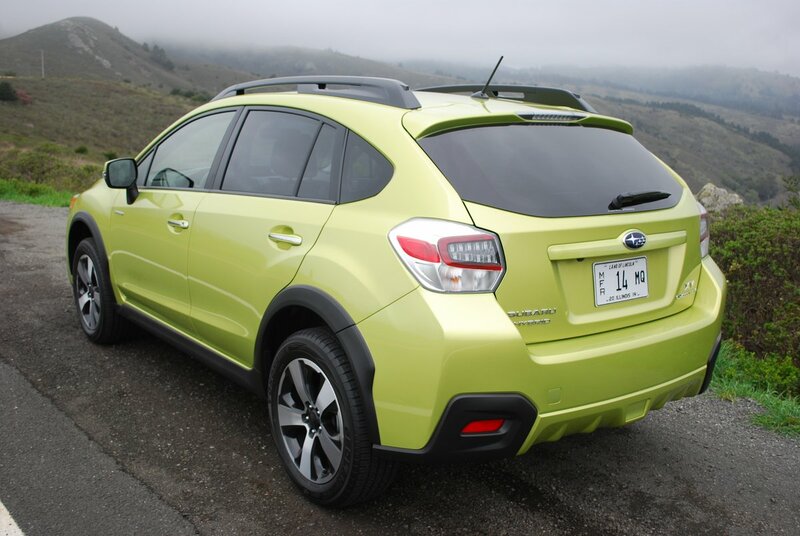 To emphasize the green allure of the new Hybrid, our test Crosstrek sported an eye watering finish called Plasma Green Pearl that wore well as our week with the car wore on. Operation of the Hybrid drive train is for the most part so seamless that you hardly know it’s present. 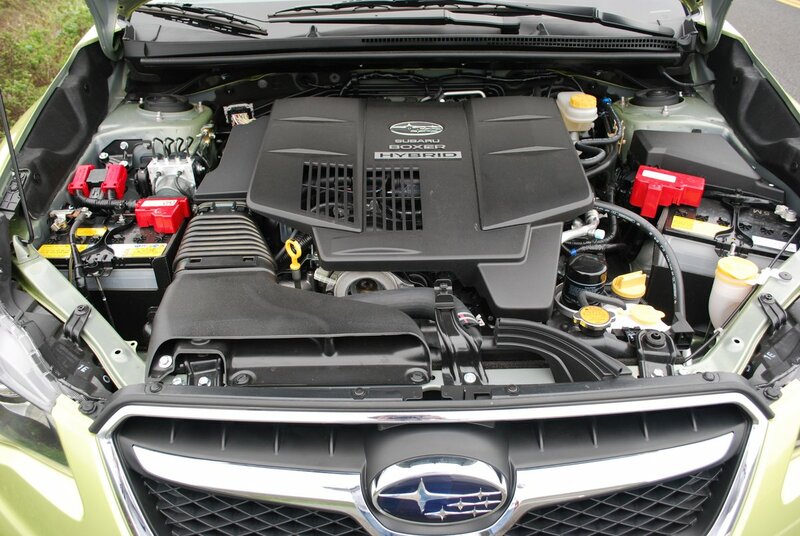 Subaru has combined their FB20 4 cylinder engine with a 3 phase synchronous electric motor to provide 150hp and 165 lb.-ft. of torque. The opposed H- configuration gas engine features twin overhead cams, 10.8:1 compression ratio, and an under square bore/stroke ratio of 84mm x 90mm. The permanent magnet electric unit is good for 10kW output and 48 lb.-ft. of torque. Working together, the gas and electric powered Hybrid posts EPA numbers of 31 MPG overall. You can expect 39 MPG on the freeway, which will yield a tad over 500 miles on the Crosstrek’s 13.7 gallon fuel tank. In city usage (29 MPG), this Subaru automatically turns itself off when you’re stopped in traffic for more than 30 seconds, and usually re-fires without hesitation, though a jolt and shudder sometimes mars the procedure. The internal layout of the Hybrid’s cabin is so functional that you wonder why so many manufacturers can’t emulate Subaru’s prowess in this regard. For example, take the rear seats here. Instead of making you search out hidden latches and mechanisms to fold them flat, the Crosstrek requires but one simple gesture to transform your interior from passenger to cargo trim. Pull up on the stem of an outboard mounted, visually obvious latch as you thrust the seatback forward, and presto, a flat floor cargo space manifests itself. No manual needs to be thumbed through, no obscure fold and tumble sequence needs to be followed. Removing the privacy screen which shields the rear space from prying eyes is equally simple when you’ve got big loads to carry. Just depress one end of the light weight stick, and the spring inside holding it in place instantly collapses, allowing you to store the part elsewhere. I recently struggled to collapse a similar unit in a Dodge Durango with such an overpowering spring that it refused to budge. The beauty of Subaru engineering is that it makes it simple tasks effortless. With that ample ride height, you might think the Crosstrek would be somewhat tipsy in normal motoring tests, but you’d be wrong. This crossover handles the curves with aplomb, and you’re almost never aware of your exalted height. The Yokohama Geolanders are surprisingly complicit in upholding their end of the cornering bargain, and on the whole, the Crosstrek handles with the precision of a Nike Cross Trainer. The combined 150hp output of the drive train, however, leaves a bit more to be desired than the handling does. In passing or merging situations, you pretty much have to wring the Hybrid by the neck to extract enough surge to be comfortable. 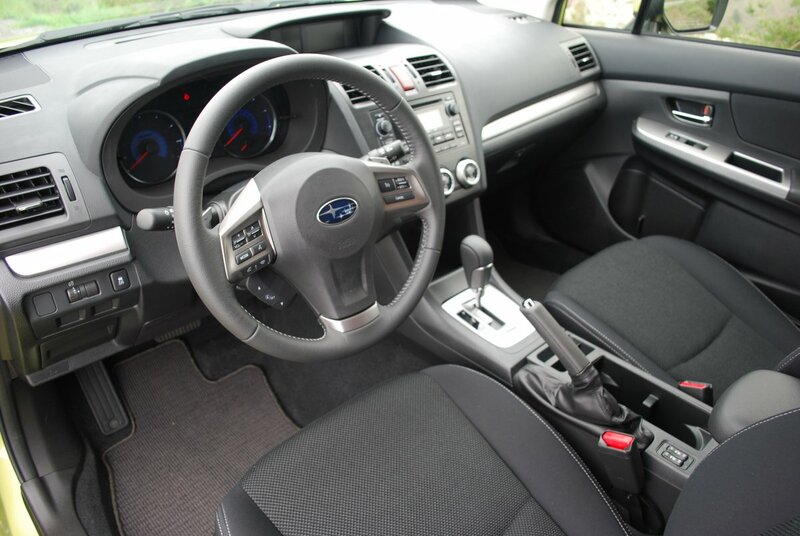 The CVT transmission, which Subaru pioneered a quarter century ago, is definitely your friend during such maneuvers, because paddles on the steering wheel allow you instant access to more rpm and more passing power. Still, this 3,165 pound Crosstrek’s gentle acceleration would benefit from a slightly larger displacement gas motor. 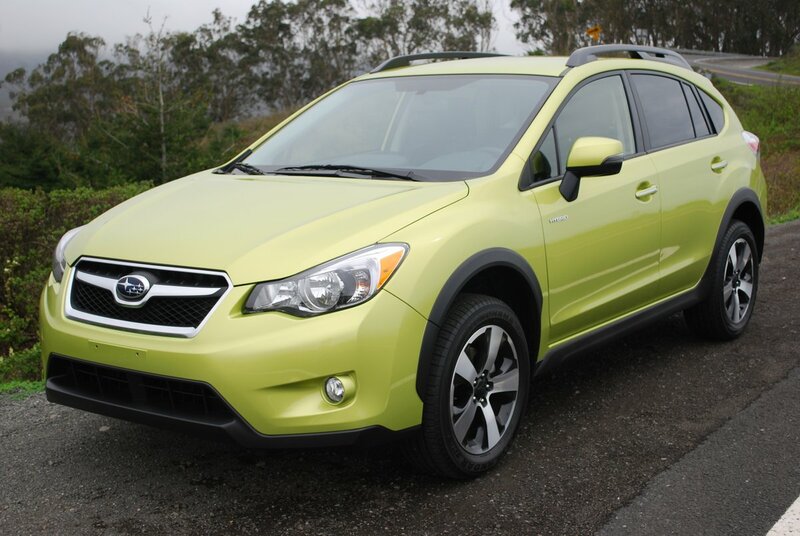 With a buy-in of just $26,820, it’s hard to beat the Hybrid Crosstrek for value, mileage, practicality and comfort. For “Just Do It” folks, the XV Crosstrek Hybrid is like finding a pair of Air Jordans at Ross Dress For Less.